From 1977-1980, Rob Caughlan was a Special Assistant to the Deputy Administrator Barbara Blum of the United States Environmental Protection Agency (EPA) and also worked as White House staff for President Carter’s Solar Energy Task Force. The head of the Public Affairs Office came to him and said that the Department of Energy (DOE) wanted to produce a film about solar energy. Caughlan was asked if he had any ideas. He wrote a treatment and turned it in. A basic script came back to him and he made a few revisions. He then saw a rough cut of the film and was pleased. He approved the continuation of the project because he knew that environmentalists, like himself, would be happy with its message. 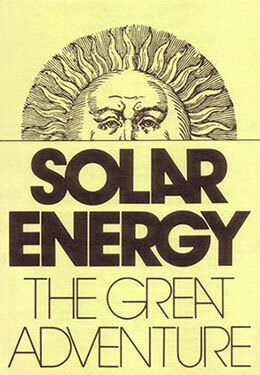 Solar Energy - The Great Adventure premiered in the home of James Schlesinger, the head of the DOE at the time. Rob's credit line was EPA. 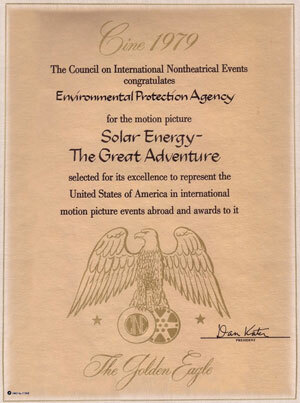 It was the federal government's top film that year and it won a CINE 1979 Golden Eagle for "its excellence to represent the United States of America in international motion picture events abroad." CINE is an acronym for the Council on International Nontheatrical Events and was started in 1957. Its original mission was the selection of American films for international film festivals. Today its mission is to support emerging and established producers of film, television and digital media through its film competitions, educational panels, screenings and networking opportunities. Each year, using a jury system, the best among the many films submitted are chosen and honored with the CINE Golden Eagle Award.